For his thirteenth recording Award-winning flutist WOLFSHEART has chosen a musical concept that deals with simplicity, emotions and soundscapes full of intensity. For the first time he works on this EP with the alented guitarist Robert Horak, his musical partner for over two years now. 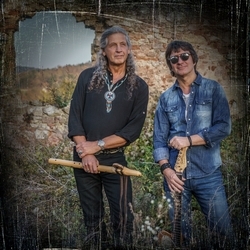 The result comes along as an "Acoustic Ride" : Six tracks create a musical journey of Native American flutes combined with the wide range of guitar artistry. This melting pot of Folk and World Music sounds fresh, unique and diverse, without using technical gadgets or cheap showmanship. This album delievers the essence of dedicated handmade music, going straight to the heart. So this means a touchpoint for the soul of modern listeners. Radio PLENITUDE : Wolfsheart's fully instrumental musical compositions, mainly Native American flutes, with sounds of nature are a musical journey that takes us back to the origins of nature, to the source of the human to even touch the soul of the listener. "Acoustic Ride", an alliance of Native American flutes with the guitar of the talented guitarist Robert Horak, gives it a more modern approach while keeping this atmosphere of communion with the essentials that accompanies us with serenity in the airy path of the notes. We are happy to share his listening on Radio PLENITUDE, every day, from march 27, 2019 to april 23, 2019 inclusive before it enters a regular program.